The other day I posted a series of messages on Twitter, in reply to a message posted by OpenSpime enthusiast David Orban. Twitter, for anyone who has managed to avoid hearing about it, is the first, and still the foremost, micro-blogging service. Each micro-message, called a Tweet, is limited to a maximum of 140 characters, and is supposed to reply to the question "What are you doing now?" But as the following example shows, a Tweet may in fact be any sort of message at all. My series of Tweets ran as follows. dantonsideways Proko-fly : a fly in the big stone soup! dantonsideways Proko-fly : a fly in the unctuous ointment of the social software interwebz! dantonsideways Proko-fly a hairdryer? A veritable FLAMETHROWER in the vanity feed of the l33t FIC Digerati! dantonsideways Hey, I'm almost as much fun as Mitch Wagner! w00T!#@! It is fitting that this string of Tweets should begin with a reference to Homer, the ancient Greek poet who gave us the heroic epics the Iliad and the Odyssey . Because this short series of Tweets forms in fact a micro-ode to someone I've called Proko-fly, considered here as an almost mythical hero. So why is Danton posting a micro-homage to Proko-fly, when Danton is a fan of open source and internet communitarians? Worse, Danton is a self-confessed "libertarian socialist," whereas Prokofy consistently decries techno-libertarianism and all forms of socialism. Rather than try to explain this mystery, let me at least try to explain the Tweets. The first Tweet replies to an offhand (and for our purposes irrelevant) message posted by David Orban, about shooing a fly out of his house. Which brought to my mind that simile used by Homer, and then led my wandering thoughts to the number one gadfly in my personal blogosphere: Prokofy Neva. The story of the stone soup is found in many cultures. Travelers arrive in a village with an empty pot, which they fill with water and place over a fire. They drop a large stone into it, and explain to the villagers that they are making "stone soup," which tastes wonderful, but just needs a bit of garnish. The curious villagers each add something, and the travelers end up with a nourishing meal. Prokofy applies the stone soup analogy to the business models of open source and social software. He says that the idea that one can make money by giving something away for free is an illusion: creative effort must be paid for. Trying to make money by giving things away free will inevitably result in a pot that contains only hot water and a stone. 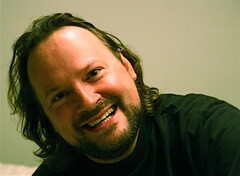 Scobleizer Ian Betteridge just posted on FriendFeed: "arguing with Prokofy is like arguing with a hairdryer." "His vanity feed (I learned this term just now through talking about this incident with many people) is his RSS of all the mentions of him on Twitter. Not just people he follows, not just keywords, but people who talk about him -- his name itself as a keyword, and people who type '@stevegillmor' to try to get him to hear, even if he isn't following them, in the knowledge that he might look himself up on Tweetscan, and find it interesting to see what someone wrote unsolicited." "'Troll' is a concept I do not recognize, do not care about, and don't follow. It is a hangover of MMORPG and The Well culture. It's got to go if we are to have a free and normal Internet. I fail to find anything remotely scientific or objective about this concept, that insider geeks use as a flag or marker to mean 'people we hate who aren't like us and won't get in our tribe'." Trolls are also said to incite flame wars. Thus I hesitated to use the word "flamethrower" in my Micro-Ode, but it was unavoidable. Hot flame is implicit in the "hairdryer" analogy, so the heroic dimension requires letting it all hang out. Danton stands in awed admiration before the magnitude of Proko-fly's achievement. He has fused the entire a-list together in one massive block of self defense against the truths they hate to hear. But what brings Mitch Wagner into the last Tweet? Mitch writes for Information Week and also hangs out in Second Life under the name of Ziggy Figaro. I enjoy following Mitch on Twitter because of his laid-back humour, seen for example here, here, here or here. Also, this makes a complete cycle, going from mild-mannered David Orban, through Prok's heroic struggles with the digerati, and back again to mild-mannered Mitch Wagner. As in Auden's poem about Icarus, the ship that had "seen something amazing, a boy falling out of the sky, had somewhere to get to and sailed calmly on." Just what makes up a compliment on the Internet, anyhow? Internet seems to be all about rating and ranking, in which case notoriety counts more than anything else. Prokofy ranks high on the notoriety scale, whereas being "mild-mannered" does little for notoriety. Being a "nice guy" likewise adds nothing to one's notoriety. But it depends what you are after in the long run. Sometimes a mild exterior can hide vast ambitions. Maybe OpenSpime is your secret plan to rule the world! My, you are practically a one-man fan club for Prokofy these days, Danton, it's weird. As for spimes, you can hardly have a conversation with a techno-neo-Bolshevik who wants to aggressively put eavesdropping devices all over your city and scrape data. That isn't someone you have a conversation with; that is someone you go to war against. Yes, Scoble blocked me, let me think...I think it was over my criticism of his thinly-veiled Silly Valley lobbying drop to Washington DC. I've come to see you, Prokofy, as a sort of folk hero. It's as if I were to sing about Paul Bunyan the lumberjack or Casey Jones the fearless train driver. While I only partially agree with your ideas, I find truly heroic your one-man crusade, first against Linden Lab and the FIC, and now against Silicon Valley as a whole. 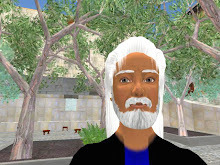 But the folk hero generally represents a social class, and you represent the army of virtual builders, traders and bloggers in and around Second Life. My original exchange of tweets with David Orban was about how Internet consumes an ever-increasing portion of our time. In your case it is truly a mystery how you can have a first job, then manage your in-world properties, read and comment on all the blogs, and still log into one social software feed after another. David Orban tweeted back something ridiculous about the future being a careless stroll through a grassy field, which prompted me to ask if he thought we would be multi-tasking "in the background" thanks to brain implants. Remember that in trying to keep up with an industrial machine, John Henry died of exhaustion. "He died with his hammer in his hand, oh lawd, died with his hammer in his hand."